For an archer looking to get a good deal on a unit he or she can use for hunting or target practice, the Spyder is quite an excellent deal. A bit better regarding craftsmanship than other models produced by the same company, it is a sound investment that you will not come to regret. Its overall resilient construction, a wide range of draw weights available, as well as its nice polished finish, make it a wise option for any shooter. An improvement of the Sage model made by the same company, this particular recurve bow comes with some improvements that should not be overlooked. First of all, it must be mentioned that the manufacturer combines four types of wood to ensure that this model benefits from the highest resilience possible. The overall construction will offer great satisfaction, and you will undoubtedly use the bow for a long time without a glitch. The first element of design we should talk about is the rounded edges of the riser and the pockets. The manufacturer opted for this solution to cut down on weight, and the results are noticeable. 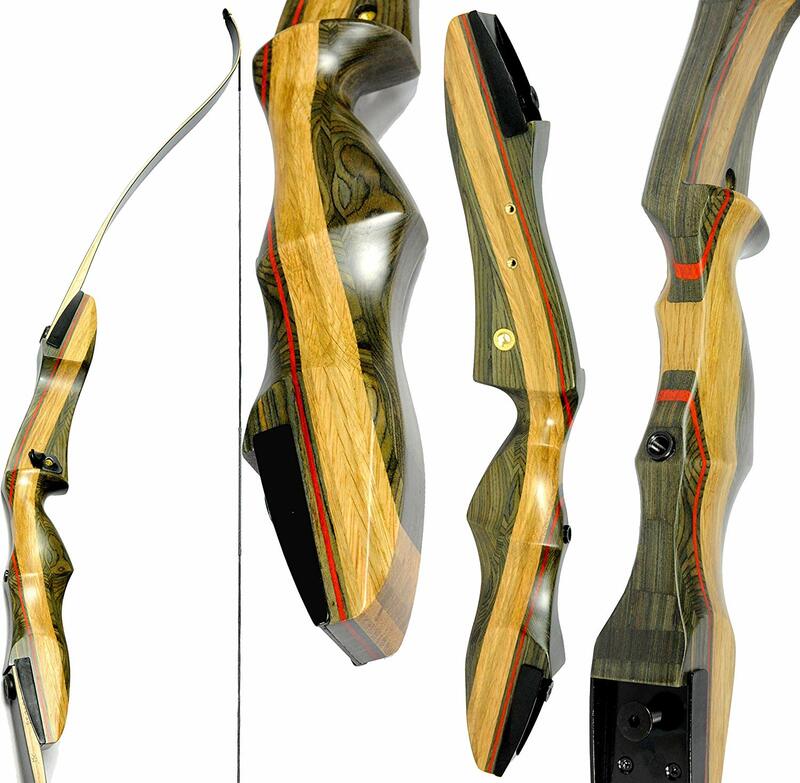 This recurve bow is lighter than the model that served as its mold, and it represents, indeed, an improvement. Besides the advantage of becoming lighter, the recurve bow reviewed here also benefits from sleek, streamlined looks that will tip the balance in its favor when you’re comparing it against others in its price range. The red wood finish riser is another element of design that will catch your eye at the very first glance. There is a Spyder for anyone. It looks like this is what the manufacturer of this model tries to say since there are some options for you to choose from. First of all, you can pick a suitable model for right-handed or left-handed users. You don’t have to experience the disappointment of not finding the bow you like in the configuration desired, depending on what dominant hand you’re using while hunting. The various draw weight options are also appealing, and let you pick a different Spyder for the entire family, should you feel inclined to do so. The draw weights go from 20lbs to 60lbs, using 5lbs increments, so it is close to impossible not to find the right one that can adapt to your shooting style. Would you like to mount more accessories on your bow? This particular model allows you to do so. The unit comes with pre-installed bushings that can be used for a variety of extras, such as plungers, stabilizers, sights, quivers, and even bowfishing reels. That also tells you something important about how versatile this model truly is. You can practically adapt it to any setup you would like to have, depending on the purpose you have in mind. The way the limb tips are designed lets you use Fast Flight or Flemish strings as you see fit. A nice touch is that the manufacturer includes some extras, such as an arrow rest with your purchase. Even though you may discover that the extras are not the same quality, they are still add-ons that you will get to enjoy for a while. Another thing that must be mentioned is that you can opt for a stringer tool to be delivered with your purchase, but you will have to check the right box for it. The Spyder may not be as silent as the most expensive recurve bows on the market, but there are no reports on it being noisy. Seeing how many shooters have already tried and tested this model until now, any issues with its performance as far as noise level goes, would have become public. Especially if you plan to use the bow for hunting, it is essential that you remain as quiet as possible, to reduce the possibility to be heard. 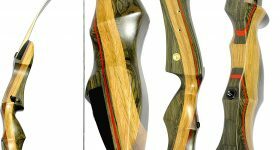 You get what you pay for and a little more when you select this recurve bow from the many available. That means that the deal for the money you will get will offer benefits. The overall construction of the bow is robust, and the design improvements over another version provided by the same manufacturer count toward making the bow more lightweight and manageable. The fact that there are some accessories included only adds value to the package.